Duck & Dry Launches Beauty Studios On High Street, In Primark. You love their clothes, then their beauty, well now try their all-new, in-storepampering service, Duck & Dry Xpress,brought to you by Duck & Dry. Luxury blow-dry pioneers Duck & Dry is introducing its bespoke and renowned services throughout Primark stores. 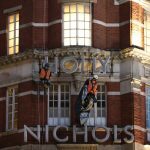 Starting with the flagship London, Oxford Street store on the 18th March, closely followed by a new large scale in-store salon and store opening, the largest in the world to date, in April 2019. Duck & Dry Xpress will soon be a permanent fixture in major Primark stores across the UK and in the near future, is set to be in 40 stores. Three stations will operate in each store incorporating hair, nails and brows. Duck & Dry Xpress , like the salons will be offering Updos and Blow Drys to shoppers with a transparent price list and plenty of style choices. Duck & Pluck will be delivering brow and eyelash services including threading and tinting and Duck & File will be taking care of your nails to create the ultimate full scale pampering experience on the shop floor. with Britain’s largest fashion retailer and found their vision to provide fast paced beauty services to the high street very inspiring. The Duck & Dry brand experience will enhance their vision with our know-how of express, quality beauty services, along with our vibrant, signature aesthetics, at high street prices”.